It is grown from seedlings, which don’t need a lot of warmth – they can even last below 0 °C (32 °) for a short time. However, they are sensitive to weeds. They don’t need to be prickled out. In dry summers, plant the seedlings with root clods. At least 30 cm (12 in) between rows and 30 cm (12 in) between plants in a row for smaller plants. 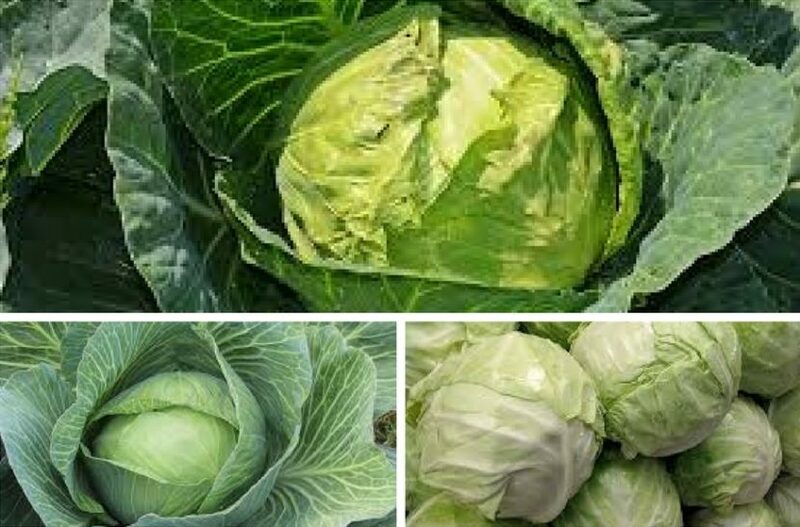 Increase the distance by 20 cm (8 in) for late cabbage, and by 40 cm (15 in) for large cabbage heads. 5 to 10 plants per person. From February on for seedlings. It depends on the variety, when to start sowing for seedlings cultivation. They need 30 to 40 days to grow and can last until the end of November in the garden. The earlier varieties can be transplanted in September. The cabbage for sauerkraut can be transplanted until the beginning of July. The seeds germinate in 10 days. Fertilize with barn manure or home compost. Grow in the first field. Use mineral fertilizers with more calcium and less nitrogen and phosphorus. If you plant the above-90 days varieties, add nitrogen fertilizers. Nettle brew is good for them as well. If the inside of the cabbage heads start to rot, the soil might lack boron. Water regularly, especially when heads are being formed – twice a week and 30 cm (12 in) deep. If too many plants ripen at the same time, adjust the plants to receive less water: cut off some of their root system with a spade or twist the heads gently, up to one fourth of a turn. Celery, calendula, tagetes, sage, thyme, cumin, mind, dill, chamomile, Swiss chard, broad beans, chives, leek, endive, cucumbers, eggplant, sweet corn. When cabbage doesn’t need a lot of space, intercrop with bush peas, bush beans, spinach or leaf lettuce. Plant celery between cabbage plants as well. Herbs repel pests. Black rot of crucifers, clubroot, butterflies and moth maggots, cabbage root fly larvae, swede midge. To prevent disease, keep the soil well drained, fertilize moderately, till regularly and water with algae brew. Don’t plant brassica plants in the same spot for four years. To protect from pests, cover with garden fabric, intercrop with celery, lettuce or spinach and use tomato mulch. Cabbage is cold resistant and can be cut when needed for a long time. It can last several months, stored in crates in a cool and moist place. To make sauerkraut, chose the right variety, don’t use sprays and don’t exaggerate with nitrogen fertilizers. Use the leaves, raw or in a variety of cooked or baked dishes. It is especially good for a winter diet as a source of vitamins and other beneficial substances. The earliest sorts ripen in 50 days, the latest in 180 days (these are appropriate only in warm atmospheres). For pickling, use the varieties that need less than 90 days. It can be grown throughout the whole summer and only a few seedlings should be planted at once. There are a white and a red variety. There used to be also the early and late varieties. For some areas, only the local varieties are good for cultivation, not the hybrids.